DECADES LONG EXPERIENCE AND QUALITY - JOIN THE WINNING TEAM! Breed info, tips for the owner, tips yard and kennel - click here. Adult dogs for sale - click here. Contact us, apply for VIP, longer questions - click here. Short, anonymous questions - ask here! Dunkel Kennels is devoted for the real, gamebred American Pit Bull Terrier. Our "stock" consist of yardfull bona fide, stonehard but yet human friendly, very healthy dogs. From this high quality bulldog pack we select only the healthiest and most perfect bulldogs into our breeding program. Right now we have almost 30 yrs of experience with gamedogs! 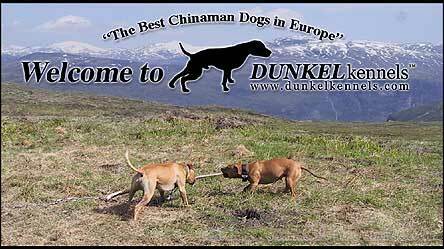 Read what Dunkel Kennels answer, click here! Yes, our dogs are darn good! We are following a very carefull breeding plan. All dogs are BFKC-registered. All dogs and puppies are fully vet checked, documented and guaranteed. The price includes* id chip or tattoo, vet documents, vaccinations, deworming, registration, some other stuff and more. In Europe you have to pick up the dog from our yard, it's most easy and most economically. *) The price excludes crate, box and possible additional veterinary needed for transport as documents, medication, inspections, international and local transports. Note that all references to competition and winning in this communication (web pages), as well as from us in general are regarding conformation, weight pulling, and legal hunting activities. We believe in the breed in its true form, and offer to our clients the best representations of this breed to be found anywhere. With that said, we will only offer to sale our dogs to those who will provide a living environment conducive to a long, natural, and fulfilled life for these dogs, in the context of social responsibility. We do and will not violate any local, international, foreign, or federal law(s). We do and will not breed or sell dogs for any illegal purposes. The content on these pages and this site can be and will be changed if needed overruled by newer information without advanced notice. Always ask for the newest info, prices, details and availability by phone, email or visit. should watch out for certain genetic diseaces. which is pure stupidity because several diceases are fatal. lethal. have the choise to take a healthy gamedog. This is one reason why we have linebred Chinaman-dogs, no problems with the health. We give the same full guarantee to all dogs and pups bought from our yard. © Copyright 1996-2018 Dunkel Kennels. All rights reserved.